Normally Friday posts will be occupied by a guest blogger, but we’re still trying to wrangle some people up and iron out the details. Plus, there were some process things that I wanted to talk about regarding this Apathea sequence, and I wanted to do so before we moved onto next week’s pages. So as you’ve noticed, sequences from Book Eight of the Apathea Ravenchilde series are intertwined through the regular narrative of Americus. At first, I thought, ‘It’s a fantasy world with all sorts of action and crazy characters and settings! It’s gonna’ be so much easier and more fun to draw than that boring real-life stuff!’. For people that might not think about the process of making comics, it can be pretty intense at times. When you’re writing a novel or short story, you get to describe the things you want and let the reader fill the rest of it out with their imagination. When you make movies and do animation, you have the tasks split up so that someone might create the set or draw the backgrounds, while other people work on costuming, props, etc. When you make comics you have to do all of that work yourself. You are the set designer. You are the costume designer. You are the actors. You are the director. While I was working on Americus the goal was to try to get two pages done a week. This might not seem like a lot, but I was juggling a part-time job and freelance illustration work, and my schedule basically allowed me two days a week dedicated to the book, which meant I had to get the two pages done in those two days. As I was drawing, I would sort of make everything up on the fly. Characters might have just been doodled a little bit in the margins of my bristol board before being committed to panels, and I would do some reference for buildings and environments online or from photos I have of places I’ve lived or been. This generally worked out pretty well… for the ‘real life’ sections of Americus. 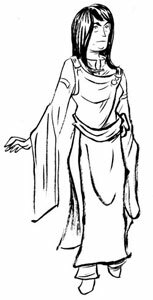 When it got to the Apathea sequences, the character-design-world-building on the fly became a lot harder and a lot more intimidating. I needed to create a world with it’s own cultures and people – and I had to do it quickly enough to have time to draw the pages in the time I had each week! I think this came out the most in the costuming – I didn’t want to just do a straight up typical European-based fantasy setting, so I tried to blend in some Asian culture aesthetics. 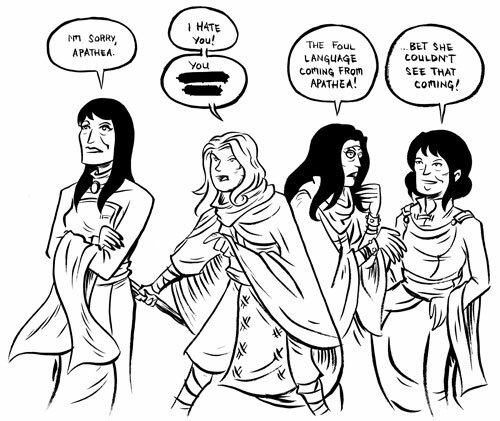 In the pages this week we are introduced to Apathea’s aunts – Soren, Eira, & Inge. 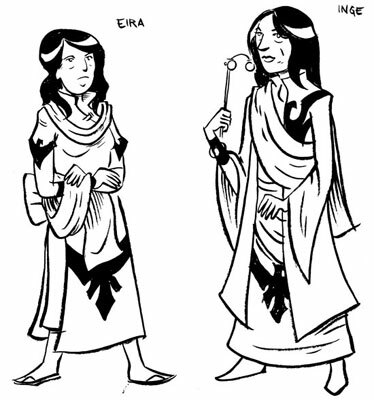 For all the headache of spending time worrying about their character designs, they only show up for this short scene in the book! Anyhow, here are some images and doodles that I did before landing on the final designs you see in the pages. Get it? 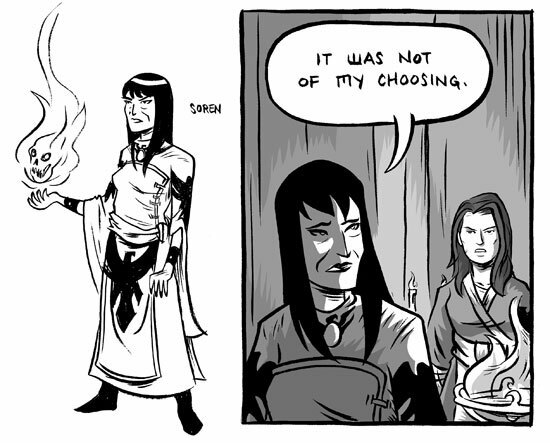 'Cause Soren's a prophet? Something else I’d like to note – despite all the complaining, there is something about this process of creating things on the fly that I really like. Sometimes unexpected things happen that work out perfectly. 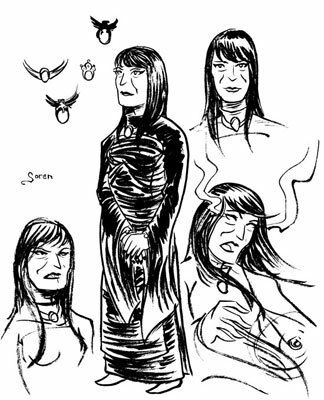 If you look at the Soren in the doodles and the Soren we see in the final pages, you’ll notice that her hair is slightly different and that it further echos the raven motif that she has. I don’t think I realized that I had done that until after I had drawn the pages. It’s nice when your subconscious knows what it’s doing even if you don’t. Anyhow, looking back I would’ve loved to have had the opportunity to dedicate more time to flesh out the world that Apathea lives in. I think it would’ve helped make it a little more rich and flavorful. But I think it’s easy for anyone to look back at something they’ve finished and wish they could’ve/would’ve done x, y, and z. All right. That’s enough hot air from me this week. Next Friday we’ll have our first guest blogger, the esteemed Greg Means!